At the world’s northernmost point, the ice is growing thinner. Between 2004 and 2008, climate scientists observed a net decrease of almost 2 feet in the thickness of Arctic sea ice. This loss is more than enough to endanger the subsistence lifestyle of the Inupiat tribe near Alaska’s Bering Land Bridge National Preserve, part of the National Park Service (NPS). The Inupiat aren’t the only ones confronting an uncertain future. Marcy Rockman, climate change adaptation coordinator for cultural resources at the NPS, says climate change is one of the direst challenges facing the Park Service, pointing to the life-changing effects in the Arctic as one alarming example. This reality, in tandem with the slow creep of sea level rise and the strong winds and torrential rain that accompany shifting weather patterns, is heralding a change in how national park sites across the country are protecting their natural treasures, as well as their cultural resources—the history-rich manmade assets under their care—and their visitors’ experiences. Rockman explains that the agency has a two-pronged approach to the issue. “There are the impacts of climate change on cultural resources, and then there is the capacity to learn from them,” she says. As part of the Park Service’s Climate Change Response Program (launched in 2010), the agency aims to place individualized climate change projections in the hands of park supervisors at each of NPS’s 411 sites by the end of 2016. In the meantime, we’ve focused on three national park sites—Fort Pulaski National Monument, Dry Tortugas National Park, and Amistad National Recreation Area—and the ways they’re approaching preservation while planning for a warmer world. Cockspur Island Light, which dates from the 19th century. The marshlands of Cockspur Island have always borne the brunt of violent tropical storms. In 1804, a hurricane dismantled Fort Greene, a 1790s precursor to Fort Pulaski, which was built in 1847 and has been standing guard on Cockspur ever since. More than 350,000 visitors per year travel to the approximately 600-acre island, meandering through the five-sided fort and taking in the divots in the fortress wall where it was struck by Union artillery shells during the 1862 Siege of Fort Pulaski. In the past few years, however, Fort Pulaski has been shaken by a different kind of barrage: the usual succession of high-intensity seasonal tropical storms, now accompanied by a sea level rise of more than 3 millimeters per year, according to the National Oceanic and Atmospheric Administration (NOAA). Fort Pulaski is situated where the mouth of the Savannah River opens to meet the vastness of the Atlantic Ocean, making it vulnerable to heavy winds, torrential rain, and aggressive high tides. During a particularly merciless deluge last fall, the highway leading to the park was completely submerged in water. 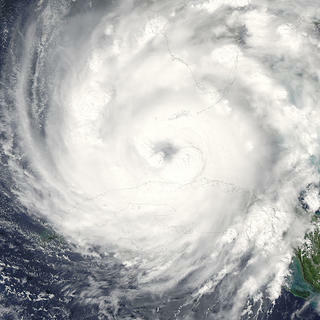 Memory and her colleagues are using data and projections from the Intergovernmental Panel on Climate Change and NOAA to help them know what to expect. The Army Corps of Engineers installed a granite revetment, or series of boulders, near the lighthouse’s base in 2013. The boulders mitigate the impact of the waves on the mud under the timber pilings that support the lighthouse, as well as the impact on the masonry itself. The Army Corps is also trying to bolster the growth of the surrounding brackish marsh, which would create a kind of buffer and absorb the destructive impact of the waves. “We can use natural resources to help protect this cultural resource,” Memory says. 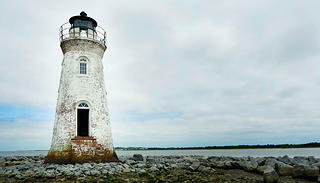 For both Fort Pulaski and the resilient Cockspur Island Light, successful preservation in the future will be a matter of trial and error. The Army Corps is using soil collected from maintenance dredging of the Savannah River to reinforce the north shore of Cockspur Island, slowing erosion and placing a barrier between sea level rise and the fort itself. Iron components have been removed from the fort, and the surrounding masonry has been repaired. Unlike Fort Pulaski, Fort Jefferson at Dry Tortugas National Park in the Florida Keys never saw battle; the U.S. military never even completely finished its construction. Instead, the fort, built between 1846 and 1875, was a safe haven for 19th-century ships traversing the Straits of Florida and the Gulf of Mexico when they needed to resupply—or wait out a hurricane. 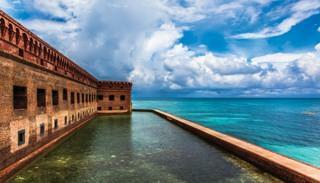 “Every season it’s like the piano keys getting ripped off the piano,” says Kelly Clark, the cultural resources specialist at Dry Tortugas, of the effects of the semiannual storm season on the fort, and the exterior moat wall in particular. The Park Service installed a sea-level monitoring station at nearby Garden Key in 2014 to collect data that will help it plan for the predicted growth in storm surges and sea level rise caused by climate change. The Park Service is close to wrapping up a 30-year stabilization project on Fort Jefferson, removing iron headers, sills, and armor blocks—which had damaged the surrounding masonry by rusting and expanding in the salty, humid environment—and replacing them with cast concrete replicas. Once that work is completed in 2018, Clark and her colleagues will start addressing (among other concerns) the needs of the moat wall, the fort’s first defense against rising water levels. “What we’re dealing with on the moat wall now is that there’s some undermining,” Clark says, referring to the sinkholes on the interior side, where seawater is getting through. Because the exterior of the moat wall is encrusted with live coral, any comprehensive work would most likely involve an environmental impact statement. Clark and her team are carefully documenting their process during the iron component removal project, in the hopes that the information will be useful for other coastal parks trying to preserve historic masonry buildings in the future. Once work wraps up in 2018, she explains, the mishmash of masonry products within the fort’s walls will provide a practical case study for how each of those products can perform under extreme circumstances. “As we finish the brick-and-mortar work, we’re then moving into this scientific monitoring phase and hoping that that’s the kind of data that might then be useful to create guidelines for other people to use,” she says. In the meantime, she is focused on the smaller-scale, but still essential, maintenance work that keeps the structures at Dry Tortugas in good enough condition to survive another storm season—tasks such as repointing brick and addressing structural issues at Fort Jefferson’s two lighthouses. Researchers from Shumla Archaeological and Research Center at Panther Cave. The ancient cave paintings, or pictographs, scattered throughout Texas’s Lower Pecos Canyonlands Region depict the stuff of legends—tales of gods and the creation of the sun, the stars, and the universe. There were once 11 such sites within the present-day boundaries of Amistad National Recreation Area, but five are now permanently submerged beneath the waters of the Amistad Reservoir. Created in 1969 when the Amistad Dam was built to control flooding, store water, and generate power for Val Verde County and Mexico’s Acuña Municipality, the reservoir covers roughly 100 square miles in the Canyonlands region. In more recent years, greater understanding about the pictographs’ cultural significance has underscored the need to preserve those that remain. Panther Cave is the most significant site within Amistad where visitors can still witness these cave paintings, which were created using a mixture believed to contain pigment, water, deer bone marrow, and yucca juice. 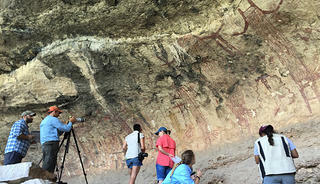 Jessica Lee, executive director of the Shumla Archaeological Research and Education Center in Comstock, Texas, estimates that most of the pictographs are between 1,000 and 4,000 years old. Amistad and the surrounding Canyonlands are naturally prone to prolonged droughts, intense storms, and dramatic fluctuations in weather patterns. In 2010, Hurricane Alex caused the reservoir’s water level to rise 15 feet in a span of five days, and floodwaters from the Rio Grande partially obscured at least 8 feet of pictograph-containing walls with silt and debris. Jack Johnson, Amistad’s park archaeologist, explains that the difference between the reservoir’s recorded high and low levels is 80 vertical feet. “At Amistad, [we have always been] able to keep the park operating smoothly despite wide variances in reservoir levels,” he says. With the intensity of flooding likely to increase in the coming decades, says Lee, the paintings on the walls at Panther Cave and other Amistad sites are in danger of either being damaged by running water and silt, or washed away entirely. Since the creation of the reservoir, dozens of feet of silt have been deposited in the river channel. This may hurt the reservoir’s capacity to absorb rainwater, gradually decreasing the distance between the water and the images. “Changing the water dynamics has put some of these murals in great danger,” she says of the reservoir’s initial creation. Johnson and his colleagues have partnered with Shumla to document the images in Panther Cave and other park sites using 3D modeling technology. At the very least, the paintings’ likenesses will be preserved in the face of any natural disasters. In 2013, Shumla archaeologists finished compiling hundreds of digital photos of Panther Cave into a 3D digital model, complete with photorealistic color. Johnson hopes to similarly document other sites within Amistad.